The victims' names were released by the city of Orlando on its website as their next of kin were informed. Here are some ways to help the Orlando shooting victims and their loved ones; you can also donate to the victims' fund, as well as express your solidarity with the LGBTQ community by posting a tribute online. You can also attend a vigil near you to honor the victims. Earlier: In the hours following the Orlando gay nightclub shooting, all officials could say publicly was that there were "mass casualties." Just before 10:30 a.m. on Sunday morning, Orlando's mayor, Buddy Dyer, said that the death toll at the Pulse nightclub had been raised to 50, with more than 50 others injured, making it the worst shooting in American history. Prior to Sunday, the most devastating mass shooting in this country's history had been the Virginia Tech shooting of 2007, which left 32 people dead and 17 injured. The Orlando death toll is significantly higher than that. The second-most fatal mass shooting until this weekend had been the Sandy Hook massacre of December 2012, which left 20 children and 6 adults dead. 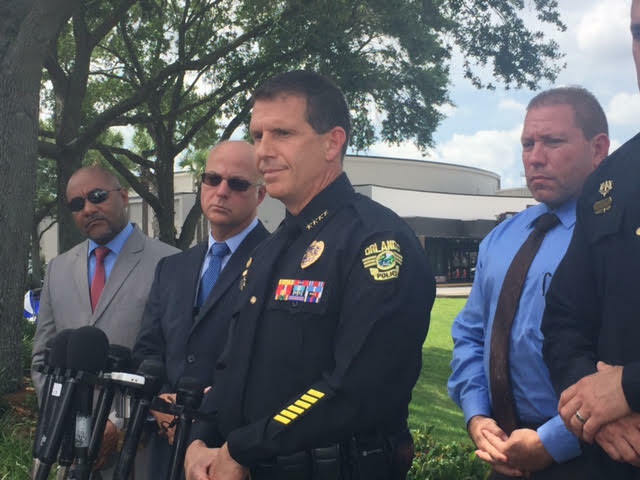 Officials had tentatively described the casualties in Orlando's Pulse nightclub as "approximately" 20 dead and 40 more injured, but revised those numbers in a news conference later Sunday morning. The president has been briefed on the shooting and is being given regular updates; he is expected to make a statement regarding the shooting shortly. Officials are currently putting living victims in touch with their families. Health officials in Orlando have plead for central Florida citizens to please donate O negative, O positive, and AB plasma blood. Here's how to do that. The FBI and other domestic law enforcement are involved in the case, and are treating it as an incident of domestic terrorism. No motive has officially been named, and the shooter died in the early hours of Sunday morning. Orlando has declared an official state of emergency. Here's how you can help victims and survivors of the shooting. This country has seen hundreds of shootings in the last two years alone, and its troubling trend of mass shootings dates back more than 15 years — and, yet, Sunday's incident is the most deadly, by a long way. Here are some tributes you can share on social media to show the LGBTQ community and Orlando that you stand with them.